Working with resistant, oppositional, emotionally dysregulated, and angry kids can be exhausting, frustrating and leave clinicians feeling burnt out. 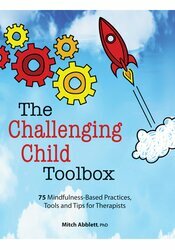 Dr. Mitch Abblett has created the remedy-with a new guide that will take you step-by-step through mindfulness-based principles, pointers and best practices to ease your work and dramatically improve the lives of kids and their families. Mitch Abblett, Ph.D., is a clinical psychologist, author and international presenter on mindfulness, compassion, self-compassion and positive psychology. www.drmitchabblett.com. Your satisfaction is our goal and our guarantee. Concerns should be addressed to PESI Publishing & Media, P.O. Box 1000, Eau Claire, WI 54702-1000 or call (800) 844-8260.